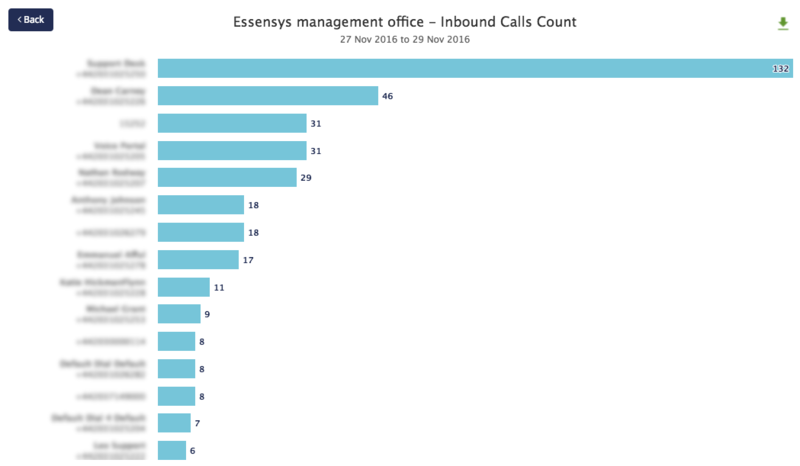 Enhanced Call Reports provide an advanced overview of all of each groups’ calls, and are especially useful for companies who have a focus on customer support or sales. A summary of all of a team’s calls are available, and the information can be used by users to assess the performance of individual members of their company. Tier 1 Users & Admins will see a snapshot of data on their dashboard, and an 'Enhanced Call Reports' link in their navigation. When following the link, they are taken to the Reports page. If the user has not purchased the Enhanced Call Reports, then they see a frosted view advising them that they need to contact the site team to request access to the service. The Enhanced Call Reports feature is added to a client's services in the same way as other any other product on Connect - via the Service Manager. Edit the client's services and search for 'Enhanced Call Reports'. Once this has been added to the client's services, they will gain access to the Reports immediately and the service will be billed along with other monthly charges. Operators and Admins have access to a Group Report showing an overview of all calls. 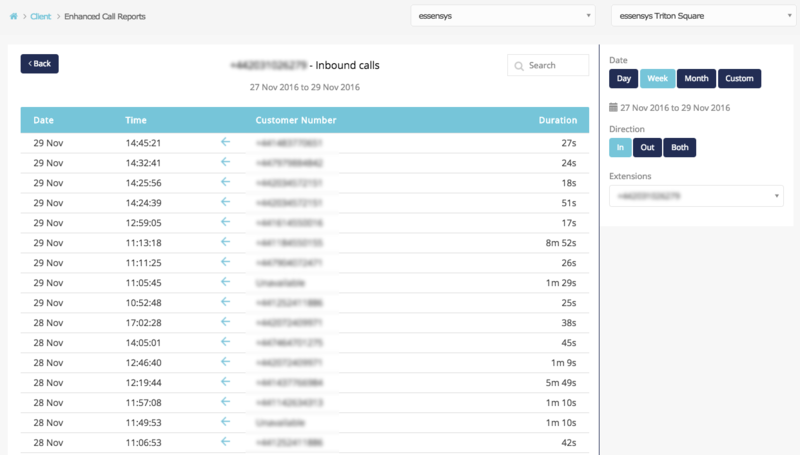 Each call made or received by phones within a company are displayed. If numbers have been associated with a user within Telephone Manager, you can also see their name displayed. Select a time period. You can choose a day, week or month, or use the Custom picker to choose a specific period of time. Choose whether you want to see inbound calls, outbound calls, or a combined view of both. Select Count to view the number of calls made by each user. Select the Call Type to view internal, external or both types of calls. The table will display each user, ordered by the number of calls. 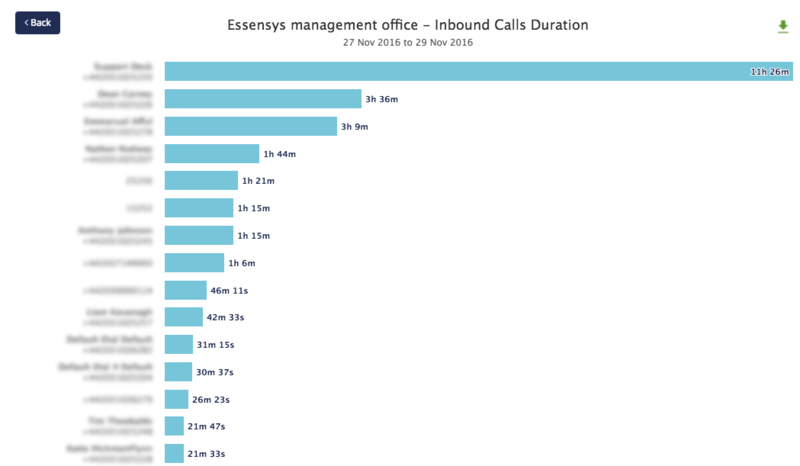 Select Duration to view the total time of all calls made by each user, or Avg Duration to view the time of each user’s average call. You can remove numbers from the table by de-selecting them from the Extension list. The list of extensions will update to reflect the numbers displayed in the main graph. Select a user to view more detail. All calls made and received by a single user can be viewed. 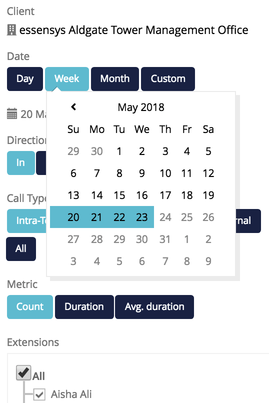 You can still use the filters to the right to change the time period, or limit the view to inbound or outbound calls. Select another user from the drop down, or select back to return to the group report.